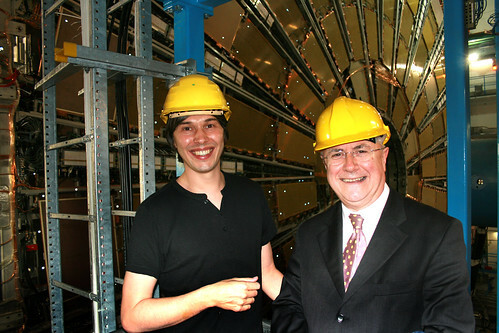 Recently, Dr. Brian Cox was invited to take part in a discussion entitled ‘Is Physics The New Religion?’ at Guildford Cathedral. During the discussion, he and the Dean of Guildford Cathedral, The Very Reverend Victor Stock, found they shared a lot of common ground. 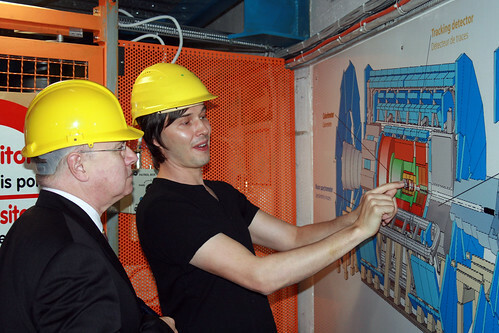 As Victor had invited Brian along to his place of work, Brian decided to return the invitation and take Victor on a tour of CERN. The result is one of the most interesting and enlightening podcasts we’ve done so far. i have just watched the Horizon programe in which Brian talked about looking for gravity, towards the end of the programe there was talk about the graviton and we where shoown a graph of where gravity should have appeared but did not the talk then went on to say that perhaps gravity was in another dimension so to speak, this then prompted in me a question, if we cannot measure a thing then does it not exist,an example that came to mind is that of the human body after death, whatever instrument is used on that body they will all say that the person is dead as we are unable to detect any sign of life. I as a medium would say different, I have had the identities of these supposedly dead people most of whome I was previously unaware I might add contact me with messages for their family and friends,so if they can exist outside of our measurable reality why can’t gravity or other things which the scientific and religous community find hard to put reason too. my best regards and hopes that you keep on searching, Albert. I wish the clergymen in Argentina were as sharp and open minded as the Reverend. A really lovely and thought-provoking exchange – thanks so much for sharing it. Regarding Reverend Stock’s parting comments, please don’t write us Yanks off yet. We hope to come to our collective senses in November. I loved the discussion in this podcast, comparing the cathedral of science at Cern to a cathedral of religion. Very inspiring! 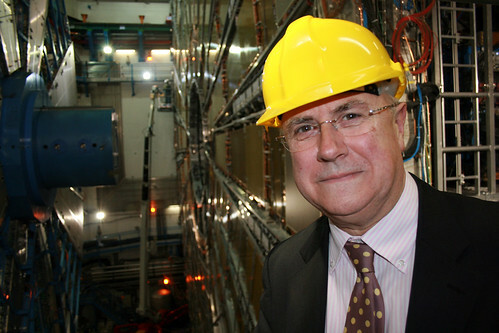 Quite simply put you are the best thing that ever happened to particle physics. You are fast becoming the Carl Segan of our time. I recently viewed your talk at TED this year and I have to say you have peaked my interest to say the least. A little more than 4 weeks ago I had no idea what the LHC was nor did I care. Now the idea of particle science consumes me. Unfortunately I live in the US in the Midwest and I have a hard time vetting my thoughts and ideas with friends and family. I hope to one day meet you and share my thoughts and ideas about this particular field of science, although I rather doubt you will have much time for such things once the experiment starts, but I just wanted to stop by and thank you for giving me the inspiration and fellowship to undertake what I am sure is going to be my life’s calling. My only regret is that it took until my 40’s to understand this and I was not involved with the development of this wonderful device. I we had teachers like Brian Cox, more of us would have understood and loved physics. Brilliant, now, once these folks have solved this, lets see their brain power work towards issues of global warming. I wish everyone working at CERN good-luck, and may those shuttered by fear open their minds. I am reading Michio Kaku’s Hyperspace, and find myself intrigued and lost at turns. PS: Mister Cox, your TED presentation was wonderful! You, sir, rock! How will this effect religions? what will be the catholic church’s argument on the creation of life? I really wonder how much more this will effect than we realize. is it the beginning of something that will end beyond our control? What is left of God in the reverends eyes? And how on earth, or in heaven, does he actually argue for his existens? What makes him believe? It’s all just words… they ring empty in my ears. In the latest creation theory 73% of the universe is dark energy and 23% is dark matter. That leaves only 4% as visible matter. “There are more things in heaven & earth Horatio than are dreamt of in your philosophy…”!! i,as a total evolutionist can not comprehend, what,if any,evidence exists that will tell me that “GOD” formed this unbelieveable planet.as all i know is,we exist as a animal as well as a “monkey””ant”beetle” whatever i state.The point is we all evolved in “TIME”.To me time does not exist,it is only a “blip”in a far more “bigger”existence. What a pleasure to be able to listen to your Podcast with the Very Reverend Victor Stock, surely one of the great exceptions amongst, usually dogmatic, clergymen. I wish the media (and society in general) spent much more time talking and learning about science and getting away from those dark, ignorant superstitions we call religion that heve become the excuse for so many wars and injustices. Interesting, I can’t wait to see what CERN gives us … To be honest, I don’t see why religion and science should conflict. As a Christian, I believe that God also reveals himself through his creation. Since God can’t contradict himself, much of the Bible shouldn’t be taken literally. Some of the greatest physicists pursued their research “to honour God and His creation.” As Galileo said: “The intention of the Bible is to teach how to go to heaven and not how go the heavens,” but I don’t quite get why so many scientists think they’re above God and can be atheists. pete, if we take the bible as gods word, there is an obvious conflict between science and religion! an athiest has an obvious motivation to further mans natural intelligence whilst making a better world/worlds for himself! what need has there ever been for man to evolve an enquiring mind if god has had the future mapped out from the metaphorical day one? I particularly liked the Reverend’s suggestion that the afterlife may be more of a dimension than a place, and how much of our so-called understanding of the Bible is about language and honorisms. I wonder then how the Bible would read if it were re-written now, with all that we have learned about our Universe so far. Prof. Cox should be proud of these podcasts, they have kept me rivetted for hours on end! I do believe that it’s impossible for any human to be above any God since it’s most improbable for any human to be above any entity that doesn’t exist. But the real can be over the imaginative. Humanity cannot ever even begin to ‘know’ itself until it begins to understand the physics of itself. Thanks for sharing Brian. Not all of us are as lucky as you. I was at a talk a number of talks recently and there seems to be an interesting idea going around that existence is naturally evolving towards higher complexity. This is something we are seeing happening all around us today with technology evolving faster than ever before. With the theories of a simplified start to the universe, this aligns with this idea. Nevermind the still unanswered question of how life evolved (perhaps the universe was designed to produce life inevitably). But the question then is this, what is the reason for the evolutionary process, and where is it taking us? Time perhaps has been created as a framework so that we can evolve? And the fact that the past and present are linked means that perhaps there is another scientific principle missing? (When I watch my pc screen it appears to stay where it is). Has this been defined at quantum level? Perhaps the quantum world can help answer some of our biggest questions! i wish there were more podcasts! Both had good points as well as open minds to each other’s points of view, so each was learn from the other. This is what science and religion should be about – not being afraid to explore the nature of God and of His creation. Very refreshing to hear. *facepalm* Because God explains everything in human experience. science and religion are trying to answer the same questions that man has been searching for: who or what are we? in the ancient world when someone was ill, people use to say thats the illness was caused by negative energy. in modern times, we know that disease cannot exist in the body without and acidic environment. acid(ph-) by its nature is a negative energy. aren’t they saying the same thing? we are finally knowing enough with science to explain what the ancient seers knew for thousands of years. Reverend Victor Stock and Brian had a wonderful conversation which illustrates what humans are looking for, yet I seem to acknowledge that Science lets us question more often while religion lags behind. With science, unlike religion, the very first point that led to this universe, is unknown and lets people search for answers. Religion has simply dictated that it had to be a creator. For us to believe, we do need proof, otherwise it belongs to each individual. You explain things so simply & allow me, a science thicky to understand everything I never did when my life depended on it at school for my GCE’s lol. I wish I had had a teacher like you. With people like you in the world I am reassured that more people will follow in your footsteps. Your explanations make big things so simple. all the podcasts are fabulous, but the one called ‘space’ is real good. It has an interview with Ann Druyen (wife of the late Sagan). She describes the year when she fell in love with with Carl Sagan, and how it coincided with her heading the voyager programme, which he led. Brian, you are a stone cast into the pool of humanity and the ripples of the offspring of your thought cast a wake that resonates through what it is to be human. As a comet on Earth you streak across the mind’s eye and open up both the heavens of God and Man bringing them together to collide in the energy of enlightenment in a simple equation of conversation. The opposing forces of science and religion are entwined into a theory of everything for the world to see in this seemingly insignificant discussion. Many of the fathers of science were tormented by “The Church”, but not you. This chance meeting has vindicated the persecution of these tormented souls for all to see, maybe it brought a tear to the eye of Galileo in satisfaction as it unfolded, a fitting blessing for the LHC. Brian, you have opened millions of eyes and they are now upon you, but do not worry your journey across the universe of discovery is just now well underway and we have no expectations other than to stand in your wake and reap the rewards of your life’s work and the changes to the realm of existence you will make. We all know that you are not alone in this quest but YOU are the face we now put to our own understanding, for you have the gift of acceptance from the populous, use it well, as you have. You are standing in the shadow of great minds, like Carl Sagan, but surely as the sun rises with its angular momentum your path will lead into the solar wind and shine brightly as you draw in your arms of intelligence progressing through time increasing your momenta. I and many others thank you for just being you, both great and “one of us” at the same time. “Death or Whiskey” that’s my kind of pun as well, rock on!!! Brian Cox: Rock Star of the cosmos. prof brian cox because of you now Im interest to study physics keep up good work thx. You have captured my very thoughts, J.A. Bourgot. I just couldn’t have put it into words as well as you have.